In the past few years The George at Abbots Leigh has had a bit of a chequered history and after its recent closure the locals fought long and hard to keep their village pub and put it back on the map as the best place to find a good pint, convivial company, and a decent meal. And so they should, as it’s a lovely old building with much to recommend it and it would be a loss not only to the community but Sunday walkers, cyclists and Somerset tourists looking for a country pub experience in the area. We loved the new interior with its clean lines, mixing traditional beamed ceiling with light wood flooring and comfortable leather banquette seating. The atrium at the far end gives a spectacular view of the vaulted roof a storey above which makes for a light an airy feel. It’s the sort of place where you could happily prop up the bar all night (and I think a few were doing just that) but we wanted to sample the new menu which by all accounts has a different twist to it. The ‘specials’ board on the wall showed the day’s offering : pork chorizo, tomato and butterbean cassoulet, and pan fried pork belly, but we decided to surf the main menu. There’s a good choice, all sorts of burgers, pizzas and a variety of main meals including vegetarian and vegan. We decided to share a pork and black pudding Scotch egg to start, (there’s a neat take on the normal pub Scotch egg!) 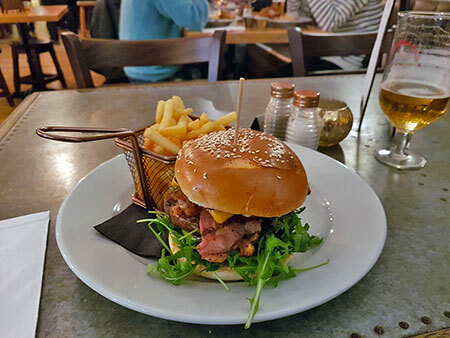 and I chose a ‘clucker’ – the clue’s in the name - a chicken burger mysteriously labelled as having a cheeky surprise on top, and my husband chose a beef burger. These come with brioche bun, fries, salad, tomato and coleslaw. 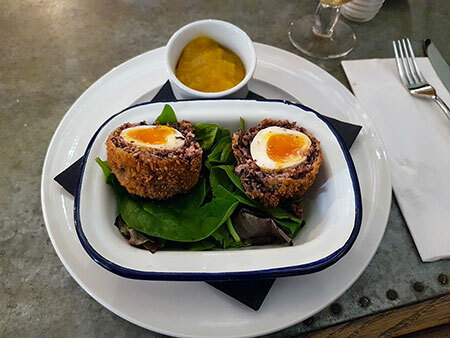 The Scotch egg was marvellous, in fact I regretted not having one all to myself; the black pudding was a great addition and made it all the more tasty. 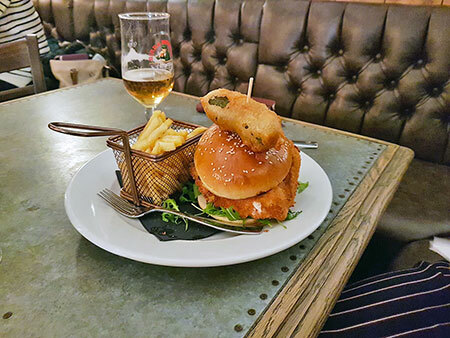 Our main courses arrived looking magnificent, and I found out at last what the cheeky surprise was on my clucker – skewered atop the brioche bun was a very substantial looking gherkin in tempura batter. It was the last thing I expected but I really enjoyed it, as I did the breaded chicken and all the accompaniments. The beef burger was great too; well-made and cooked perfectly; all in all we couldn’t have enjoyed our supper more. Service was excellent, orders are taken at the table for both food and drinks and the atmosphere was one of jollity leading to us ordering too many drinks I suspect but that’s what your local pub is for. Welcome back, the George at Abbots Leigh!